It’s been a couple of months since I participated in a flash fiction challenge, but this prompt brought two different stories to mind, so I decided to have a go at one of them. Unsurprisingly, this one has a historical slant. This is the prompt, kindly provided by Priceless Joy. Image courtesy of Pixabay . . .
Lady Penelope withdrew her hand from the marmalade pot and gaped at the grinning sixteen-year-old across the breakfast table. Her husband, Lord Geoffrey Troughton, engrossed in reading the morning news, showed no signs of having heard their son’s request. Penelope went back to eating her toast. She’d have no further say in the matter now. Previous Christmassy Nottingham In The Rain! Yes, the story hints at the male dominated household – lord and master idea. But many upper class women were quite content with the role of running the household and swanning off to social gatherings. I never realized the point of that odd design was for them to go faster — very interesting! Yes, it’s all very scientific! It seems that at the time, bicycles were all being developed with increasingly bigger front wheels – until they reached penny farthing size. It’s all about the number of pedal turns compared to the number of wheel turns. The problem was that if the rider came to a sudden halt, he would likely be thrown over the handlebars (which led to the need for safety helmets). Ah, that makes sense about the wheel turn-per-pedal turn — and about the danger too. Nope, not increasing my desire to get on top of one! Interesting that parents always want to know about their children’s new ideas but when it comes to the push they usually don’t agree or want to accept the new things! Good story. I can see in my mind all those school boys riding their penny farthings to school while the girls watch them in their long dresses. I am also not in full writing swing at the moment. I’ve only done Sunday Photo Fiction this week. I’ll be over to read it as soon as I’ve read a few more of the FFfAW entries. 🙂 I’d forgotten how long it takes to go round the community, but it’s only fair to do so. I’ve never tried the Sunday challenge, but I may do some time next year. Flash fiction is great to do, but so time consuming. I know you’ll have finished school now for the holiday, so I hope you have a good rest and also, a wonderful Christmas! You need to relax and enjoy yourself. I’m getting quite excited about it all (as usual). I love this!! what a great story Millie! Yes it was so lovely! Apart from the awkwardness in riding one them Millie I bet they were all the rage back then….a bit like my son’s game console…..have a good day and a great Christmas if I don’t see you again to you and all your family….its a busy time of year…. Modern young people would howl with laughter at the idea of a Penny Farthing, whereas a games console would be ‘really cool’! I suppose the idea of any new invention takes the interest of people of that time, one way or another. These bikes look so comical to us and I can’t imagine how it would feel to ride one of them. The hair-raising speeds would probably take my breath away! Lol. It’s so easy to laugh at things of the past. The fairies send you their best wishes, so you can take it they are behaving, they usually do around Christmas it has something to do with them believing the whole ‘ naughty or nice’ thing. Thanks for riding by on your penny farthing…. Lovely! 🙂 Great story. Missed you Millie Thom. 🙂 Looking forward to that email. Thank you. Hi again, Joycelin. I got the email off earlier today, so I hope you find it OK.
🙂 Thank you. Will reply today. I love this story! Excellent, as always! So good to see you back Millie. I have missed you too. The story is just wonderful. I wonder what it felt like to ride one of those bikes? It looks to me like it would be very hard to ride. Hello, PJ. You have no idea how much I’ve missed doing your challenge. The last one I did was in early October, so it feels very good to be participating again, if only for a while. I almost wrote a story for last week’s photo (one Lou sent to you, taken in Bowness on the banks of Lake Windermere when we were there a couple of years ago). I had a story in my head, but no time to write it. I couldn’t resist this week’s prompt.The Penny Farthing looks awful to ride, especially for women in those long dresses, but I don’t suppose I’m ever likely to find out! I’ll come over and read other entries as soon as I can today. Thank you for the lovely welcome back! Truly appreciated. You are a very busy woman and with the holidays I’m sure you are even busier. I would have loved to have read your story last week but I understand not being able to participate. I’m thrilled you participated this week! I hope you are doing well and are having a wonderful holiday! Ah, that is sweet Millie! I’m happy to know you enjoy participating in the FFfAW challenge. I have to admit, I too miss being “Santa Claus.” Having young children that believe in Santa is so much fun!. It is fun. The secrecy makes it all so exciting. I used to be up earlier on Christmas morning than the children. I couldn’t wait for them to open their presents. It was such a special time… chaotic with six of them, but wonderful. I hope to do next week’s unless you are having a break for the holiday. I don’t plan on taking a break. Unless something happens, I will be posting the challenge next week as usual. You too Millie! I hope you and your family have a great Christmas! Too bad Lady Penelope seems to not understand what fun riding a bike can be. Although, I do wonder how difficult it would be to ride one of those types of bikes. It’s very nice to meet you, Millie. I agree those particular bikes seem to produce a lot of humor. I suspect ladders were necessary to get up there. I had to click onto your blog to check out who you were – and was surprised to find it was you, Belinda. Thank you for liking my story! It’s the first flash fiction I’ve done since early October, and I’ve really missed it. But, in January, I’ll be back to concentrating on Book 3 and will be blogging very little at all for a few weeks. Hello Millie. Yes I came back but decided the only blogging I should be doing is for my short stories …. or else …. I will never write a novel! I just tried to get into your blog but it denied me access. So it seems we won’t be getting back to you. Great photo, and I too like your story. I can just picture this wonderful English family having breakfast! Good job, Millie. It was a wonderful fit and very well written, Milly! It would be really good if you joined in this challenge, Lina. It’s a great one to do, and you’d get lots of useful feedback. I haven’t joined in since October because I’ve been getting on with my book, but I really miss it. My daughter, Louise (thestorytellersabode) still does it evry week, though. Thank you for that awesome comment Aquileana (I’m continuing in the Epic Awesomeness vein here). I love the Victorian era, and those upper class families were so prim and proper – and quite stuffy! There are several of those old bicycles that are comical to look at, but the Penny Farthing is my favourite. As for your nomination, I have already seen it and commented on your post. But I’ll say another enormous Thank You for it here and will try to do the post before Christmas. Thank you also for following me on Twitter! I signed up for it weeks ago, but have only just worked out what I’m supposed to do with it. (Just call me Dumbo!) My daugher, Louise, (at the storytellersabode) helped me to sort things out, and stop my image from being an egg. Lol Modern technology and me really don’t mix. Fun story – a conversation being had across the breakfast table right now in many homes, I bet, but “Victorianised”! Santa has received my list! But I had lots of different ‘must haves’ too, as I’m sure you did. Interesting mix of fiction and history Millie.. Too good! Brilliant story Millie, made for a fun read. I didn’t write this week because I was doing Writing 101: A Poem a Day. It just ended on Friday. Have a great weekend. I could imagine you writing a novel set in that period. It also might be something popular with readers given the success of D. Abbey, which I haven’t seen but I did enjoy Upstairs downstairs. Now that is showing my age! Upstairs Downstairs was the best! I think I watched every episode. The characters were excellent. Oddly enough, I haven’t watched Downton Abbey yet, either. We keep saying we will but never seem to get round to it. There is something about it that doesn’t appeal to me and I have not yet put my finger on it! Perhaps that is it. I am a bit of a colonial egalitarian!!!!! Lol! Then I can see why you and I agree on many things!!! Thank you, Aletta. I enjoyed writing it. It’s the first flash fiction I’ve had time to do for over two months, and I really missed it. Great story! 🙂 I think she is outnumbered two to one. It kind of reminds me of today’s generation and the electronics available. The children know all about the new gadgets and how to operate them….some parents are still trying to catch on and often times ask the advice of the children. That’s very true. Jessie. The younger ones take new ideas in so much easier than older people (like me!) already set in their ways. Hello, Ellespeth. Thank you for that nice comment and welcome back to flash fiction. This is the first one I’ve done since early October and I’ve really missed it. But needs must. As for the names… I really didn’t think about that until after I’d posted. I chose Penelope as an old-fashioned name suitable for a ‘lady’ without realising I’d linked her abbreviated name, ‘Penny’, to the bike. Wow!! That’s a lot of flash fiction to write, no wonder you gave it a break for a while! Well, yes, tht’s true. But I just love to be outdoors a lot. I’d go mad if I had to stay in all day. I had a lot of years of teaching, which meant I had to go to a gym at night for exercise, when I had time! But it’s not like fresh air, is it? Lord and Master! It just seems like such a far far away time!! What a name for a bike with an interesting connection to the story. Thankfully, many of the aspects of Victorian life are well behind us. The status of women wasn’t good at that time, to say the least, until well after WW1. We have much to thank people like the Suffragists and Suffragettes (and groups that you will, no doubt, know about in the U.S.). 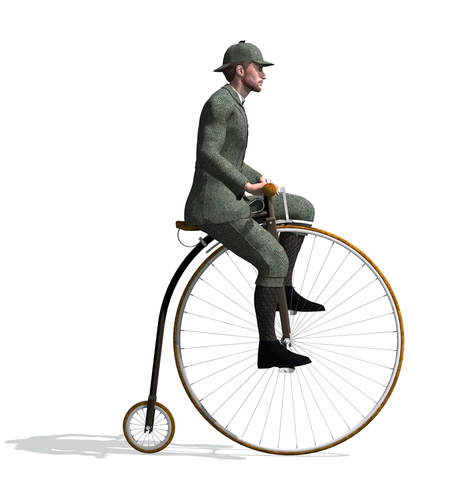 As for the Penny Farthing, it’s such a comical bike, I just had to include it in my story. We have many a great women for the liberties we enjoy today. Very true. I’m sure we could both list a few, too. I not only enjoyed your story, but I learned something new and it has inspired me to participate in the flash fiction challenge. Thanks so much, Millie! The Victorian era was simply beautiful once you get past all the serious inequalities of the time. It was so beautiful that people get lost in it’s fantasy. Yes, I find the Victorian period fascinating, too – but I’m thankful not to have lived at that time. As you say, it was full of inequalities, and such poverty. I’d like to write a book set in that period at some stage. But it will have to get into the queue with the rest of my ideas. 🙂 Thank you for liking the story! 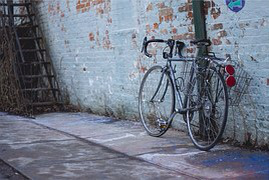 Very well constructed indeed, both your story and the bicycle…however much it looks uncomfortable and nerve-racking to ride.